Celebrated for her proficiency as both a pedagogue and a performer, Rachel Calin has been called “a lyrical soloist in command of her instrument,” by the New York Times. In 1994 she won the Juilliard Concerto Competition, making her concerto debut at Lincoln Center’s Alice Tully Hall with the Juilliard Orchestra. Subsequently, she has made concerto appearances with the Burlington Ensemble, Metamorphosen Chamber Orchestra, and the Sejong Soloists. Calin has dedicated herself to both teaching and chamber music. She is the longstanding sole bass faculty member at the Perlman Music Program, a program for exceptionally gifted pre-college aged musicians headed by Toby and Itzhak Perlman. She has also held faculty positions at Stony Brook University and the McDuffie Center for Strings at Mercer University. As a chamber musician, Calin has appeared in concert throughout Asia, Europe, the Middle East and the United States. She can be heard on NPR’s Performance Today, both in live and recorded broadcasts, and has collaborated with Myung-Wha Chung, Lawrence Dutton, Frank Huang, Ron Leonard, Itzhak Perlman and Gil Shaham, among others. She has performed frequently with the St. Paul Chamber Orchestra and the New York Philharmonic, and has made appearances at the Aspen Music Festival, Live from Lincoln Center, Mostly Mozart, and Ravinia. Calin can also be heard on numerous movie and commercial soundtracks, including The Departed and Extremely Loud and Incredibly Close. She has given the world premieres of works by composers such as Lera Auerbach and D. Edward Davis, and has performed with many contemporary music ensembles including Sequitur, Composers Concordance and Metropolis Ensemble. Calin received a BM and MM from the Juilliard School, where she studied with both Homer Mensch and Eugene Levinson. In addition to Juilliard, she also trained with Jeff Bradetich, Paul Ellison and Denise Searfoss. 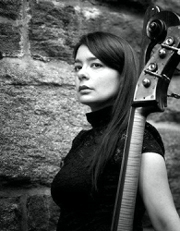 She was the recipient of an instrument loan from the Karr Foundation, and currently performs on a double bass crafted by Carlo Giuseppe Testore in 1690. BM, The Juilliard School, New York, NY, 1996 (Double Bass Performance). MM, The Juilliard School, New York, NY, 1998 (Double Bass Performance).